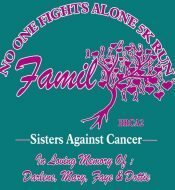 This 5K is to help raise awareness for BRCA2 a hereditary cancer gene that causes higher risks of breast and ovarian cancer. It is in honor of four sisters that fought long and hard battles against cancer. Faye Garis, Mary Lomison, Darlene Boone, and Dottie Butts. They all four lost their lives to this horrible disease way to early in life. We want to help raise awareness of this gene so families can get tested and get the knowledge they need to help them with preventive steps against this disease.